These wetsuit boots are highly durable quality boots that provide extra warmth in the water and offer protection, comfort and grip for use in a range of water sports. Boots are available to fit UK kids foot size Infant 9 / EUR 27 to Junior 5 / EUR38 (subject to stock). 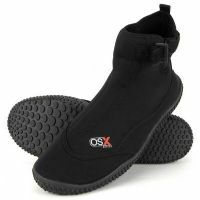 These Osprey wetsuit boots are from the OSX series and are manufactured to a high standard. They are made from 3mm neoprene and feature a velco strap at the ankle. The sole and toe area feature rubber for comfort and grip.